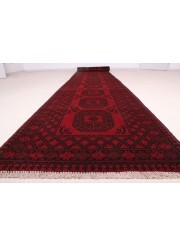 Feel Pai: 150 x 100cm: This beautiful rich traditional tribal Turkoman rug is known as Feel Pai design. It is one of the oldest and most popular designs originating from Afghanistan. It comes from the Aqcha region of Mazar-e-Sharif in northern Afghanistan, which is an important rug trade centre, ..
Mauri Gul: 350 x 250cm: This beautiful rich traditional tribal Turkoman rug is known as Marui Gul design. It is one of the oldest and most popular designs originating from Afghanistan. It comes from the Aqcha region of Mazar-e-Sharif in northern Afghanistan, which is an important rug trade centre..
Mauri Gul: 400 x 80cm: This beautiful rich traditional tribal Turkoman rug is known as Marui Gul design. It is one of the oldest and most popular designs originating from Afghanistan. It comes from the Aqcha region of Mazar-e-Sharif in northern Afghanistan, which is an important rug trade centre,..
Feel Pai: 200 x 150cm: This beautiful rich traditional tribal Turkoman rug is known as Feel Pai (Elephant Foot) design. It is one of the oldest and most popular designs originating from Afghanistan. It comes from the Aqcha region of Mazar-e-Sharif in northern Afghanistan, which is an important ru..
Mauri Gul: 400 x 300cm: This beautiful rich traditional tribal Turkoman rug is known as Marui Gul design. It is one of the oldest and most popular designs originating from Afghanistan. It comes from the Aqcha region of Mazar-e-Sharif in northern Afghanistan, which is an important rug trade centre..
Mauri Gul: 500 x 79cm: This beautiful rich traditional tribal Turkoman rug is known as Marui Gul design. It is one of the oldest and most popular designs originating from Afghanistan. It comes from the Aqcha region of Mazar-e-Sharif in northern Afghanistan, which is an important rug trade centre,..
Feel Pai: 200 x 105cm: This beautiful rich traditional tribal Turkoman rug is known as Feel Pai (Elephant Foot) design. It is one of the oldest and most popular designs originating from Afghanistan. It comes from the Aqcha region of Mazar-e-Sharif in northern Afghanistan, which is an important ru..
Feel Pai: 340 x 255cm: This beautiful rich traditional tribal Turkoman rug is known as Feel Pai (Elephant Foot) design. It is one of the oldest and most popular designs originating from Afghanistan. It comes from the Aqcha region of Mazar-e-Sharif in northern Afghanistan, which is an important ru..
Mauri Gul: 150 x 100cm: This beautiful rich traditional tribal Turkoman rug is known as Mauri Gul design. It is one of the oldest and most popular designs originating from Afghanistan. It comes from the Aqcha region of Mazar-e-Sharif in northern Afghanistan, which is an important rug trade c..
Mauri Gul: 125 x 80cm: This beautiful rich traditional tribal Turkoman rug is known as Marui Gul design. It is one of the oldest and most popular designs originating from Afghanistan. It comes from the Aqcha region of Mazar-e-Sharif in northern Afghanistan, which is an important rug trade centre,..
Feel Pai: 500 x 82cm: This beautiful rich traditional tribal Turkoman rug is known as Feel Pai design. It is one of the oldest and most popular designs originating from Afghanistan. It comes from the Aqcha region of Mazar-e-Sharif in northern Afghanistan, which is an important rug trade centre, j..
Mauri Gul: 200 x 150cm: This beautiful rich traditional tribal Turkoman rug is known as Marui Gul design. It is one of the oldest and most popular designs originating from Afghanistan. It comes from the Aqcha region of Mazar-e-Sharif in northern Afghanistan, which is an important rug trade centre..
Mauri Gul: 300 x 200cm: This beautiful rich traditional tribal Turkoman rug is known as Marui Gul design. It is one of the oldest and most popular designs originating from Afghanistan. It comes from the Aqcha region of Mazar-e-Sharif in northern Afghanistan, which is an important rug trade centre..
Mauri Gul: 300 x 82cm approx: This beautiful rich traditional tribal Turkoman rug is known as Marui Gul design. It is one of the oldest and most popular designs originating from Afghanistan. It comes from the Aqcha region of Mazar-e-Sharif in northern Afghanistan, which is an important rug trad..
Mauri Gul: 200 x 100cm: This beautiful rich traditional tribal Turkoman rug is known as Marui Gul design. It is one of the oldest and most popular designs originating from Afghanistan. It comes from the Aqcha region of Mazar-e-Sharif in northern Afghanistan, which is an important rug trade centre..
Mauri Gul: 100 x 50cm: This beautiful rich traditional tribal Turkoman rug is known as Marui Gul design. It is one of the oldest and most popular designs originating from Afghanistan. It comes from the Aqcha region of Mazar-e-Sharif in northern Afghanistan, which is an important rug trade centre,..
Mauri Gul: 145 x 50cm: This beautiful rich traditional tribal Turkoman rug is known as Marui Gul design. It is one of the oldest and most popular designs originating from Afghanistan. 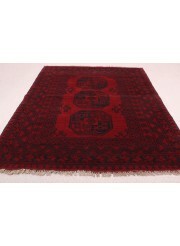 It comes from the Aqcha region of Mazar-e-Sharif in northern Afghanistan, which is an important rug trade centre,..